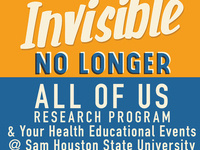 SHSU’s School of Nursing, in partnership with the Newton Gresham Library, invites Huntsville community members along with all SHSU students, faculty and staff to an educational event to learn more about the All of Us Research Program which is a new effort from the National Institutes of Health (NIH). It is a historic, longitudinal effort to gather data from one million or more people living in the United States to accelerate research and improve health, By taking into account individual differences in lifestyle, socioeconomics, environment, and biology, researchers will uncover paths toward delivering precision medicine—or individualized prevention, treatment, and care—for All of Us. A Light lunch will be provided.